Bahrain: When A Failed Uprising Is Not A Failed Revolution : NPR Public Editor A Morning Edition report said that the Arab Spring "uprising" in Bahrain has "definitely failed." Yet, unrest continues. So is the "revolution" over? Or are reports of its death greatly exaggerated? The newsroom is divided. Join the discussion. Bahraini protesters wave their national flag in the village of Sanabis near Manama on Feb. 14, 2011. Updated 1/27/2012 6:10 p.m.(Click for the latest): Digital news editor Greg Myre weighs in on Bahrain web headline. February marks one year since the start of a civil uprising in Bahrain, an island in the Persian Gulf. It was one of many countries to join in the so-called Arab Spring. As part of a recent series on the movement, guest host Linda Wertheimer on Morning Edition introduced a story on Bahrain by correspondent Kelly McEvers by saying: "Only one of the major uprisings has definitely failed, and that's where we'll go next." In her report, McEvers says, "Bahrain became the one Arab country whose uprising was definitively put down." That declaration is in the past tense, while the uprising in Bahrain is an ongoing event whose conclusion has not yet occurred. In many respects, the 14 February 2011 uprising has been wildly successful in raising the real situation that has prevailed in Bahrain for decades into the world's consciousness. For years and years it was possible to hear no mention of Bahrain in many "mainstream media" outlets in the United States, including NPR. As a follow-up, Rizzo sent a Tweet noting that the State Department has just issued a travel alert because of potential unrest on the island. "Who's fooling whom?" he asked. Just yesterday, a news bulletin from Bahrain reported that a protestor died after a clash with Bahraini police. Earlier this week, the State Department announced that it was relocating employees due to an increase of demonstrations. Bahrain's mass uprising of Feb-March was definitively put down. Since then, protesters have desperately tried to re-kindle that mass uprising, to no avail. While protests in Bahrain are almost daily, they are usually small and confined to individual villages. Those that make it out of the villages are violently suppressed. In the coming days, as the one-year anniversary of Bahrain's uprising approaches, there's a chance that the protests might grow larger and more effective and meet with more violence — hence the U.S. embassy warning. Even if this happens, our reporting still stands as correct. And we will follow all new developments. 'Uprising' and 'revolution' 2 very different things. Uprising of Feb-Mar 2011 failed. Revo ongoing. Political unrest is far different from political revolt. There is daily political unrest in China. On that basis, would you have us say that there is a political revolt going on in China, with the implication that the political unrest has the potential to unseat the government? McEvers story, in fact, makes clear that limited unrest is continuing in Bahrain's villages, but they are mostly out of national sight and a far cry from the earlier massive street protests in the capital. "This is all that's left of Bahrain's revolution," she concludes. Listener Rizzo objected to this line, too, but it is correctly supported by the story. A headline writer for the online edition, however, seemed to miss the language nuance. The headline said: "Bahrain: The Revolution That Wasn't." Lest anyone think NPR is a monolith with a single point of view, the following response shows how reporters and editors disagree as much as listeners and readers on many matters. Shortly after I posted the "newsroom" response laying out the difference between an uprising and a revolution, Greg Myre, a foreign editor on the digital news desk, sent the note below defending the digital edition headline. He takes exception with the definition by the reporter and other editors of just what constitutes a "revolution." Such debate is normal and healthy in the newsroom; we would like to open it to your participation. More than semantics are at stake. If you're Bahrani, each word counts. I've discussed the headline on the Bahrain story (Bahrain:The Revolution That Wasn't) with several of my digital colleagues, and we feel that this is a valid way to summarize this particular story, as well as the developments over the past year in Bahrain. 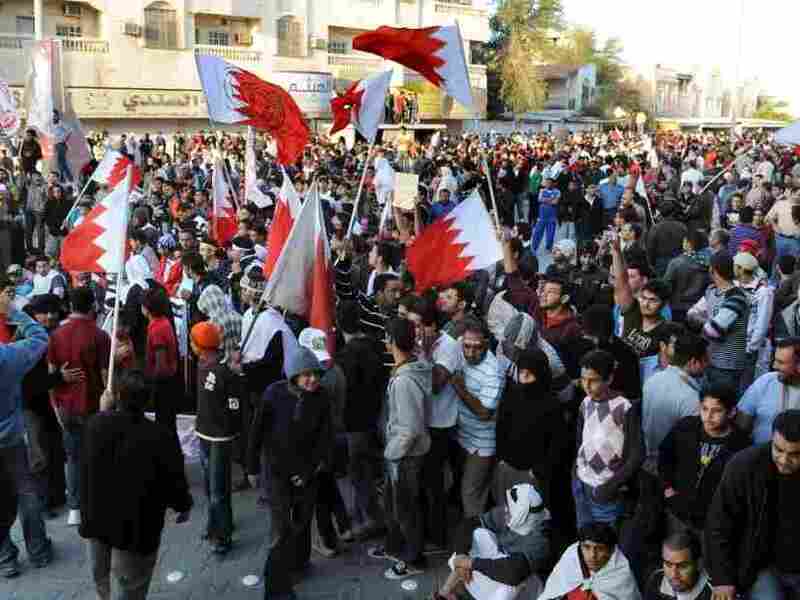 The Bahraini protesters launched an uprising with the goal of ousting the ruling Al Khalifa family. This came in the wake of successful revolutions in Tunisia and Egypt. But the attempt at a revolution has failed, at least for now. The uprising was suppressed. There was no revolution in Bahrain and the Al Khalifas remain in control. As the story notes: "There's no large movement as was the case back in February and March. And from what a lot of people say, there's not going to be one anytime soon." ..... "For now, the uprising appears to be over." The online story makes no mention of an ongoing revolution. This is something that was first mentioned in Kelly's subsequent tweet. I think it's highly debatable whether there's an ongoing revolution in Bahrain. A revolution is when there is a fundamental change in power, and nothing like that has happened in Bahrain. There are currently small-scale protests, something that is happening in many countries around the world. Maybe they will become something larger, maybe they won't.